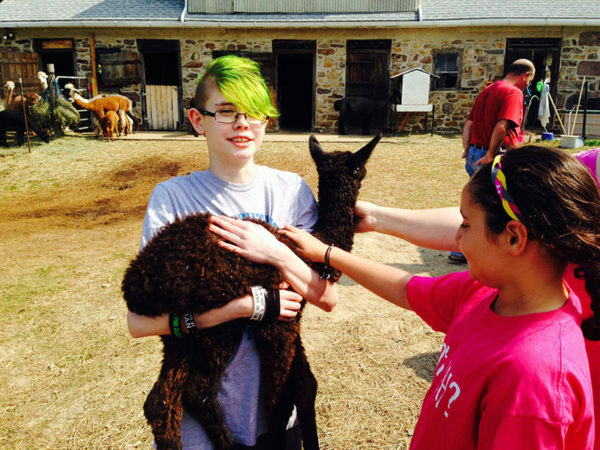 Early summer is alpaca baby season! This is Sarah with Mac (Macintosh), one of this year’s crias. Happy August, everyone! I’m excited to share a roundup of what our family’s unschooling has looked like so far this summer, not just because it’s cool (it is), but because I’ve been able to connect with a lot of new people following an interview about unschooling that I did for USA Today’s back-to-school magazine. If you’re catching one of these updates for the first time, I’m glad you’re here. This is a fun way we can show just a little bit about what unschooling looks like in our family. Check out our archive of previous wrapups here for some more info on why we take this approach and some other highlights of our adventures. As part of a program our library does each summer, there’s a challenge to hike and find waystations in 30 local parks. 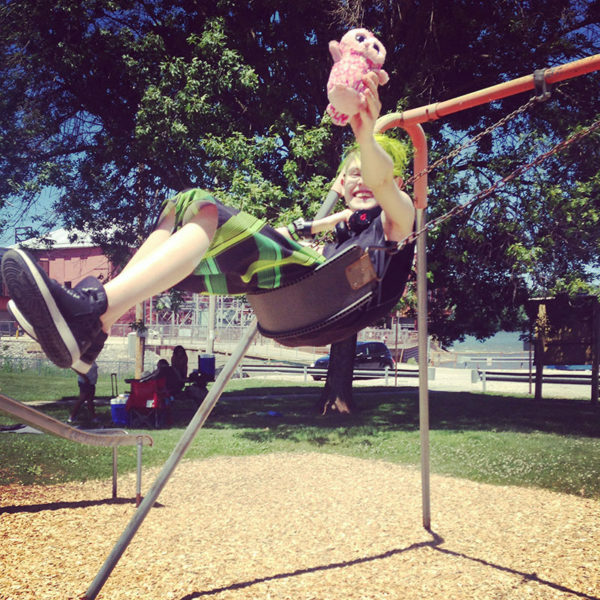 We did a few, accompanied by our trusty pink owl Fwoops, including this one where we found a cool swingset. I’m playing around with some other ideas that might allow us to share highlights more frequently, so I hope you’ll stick around and see what we come up with. 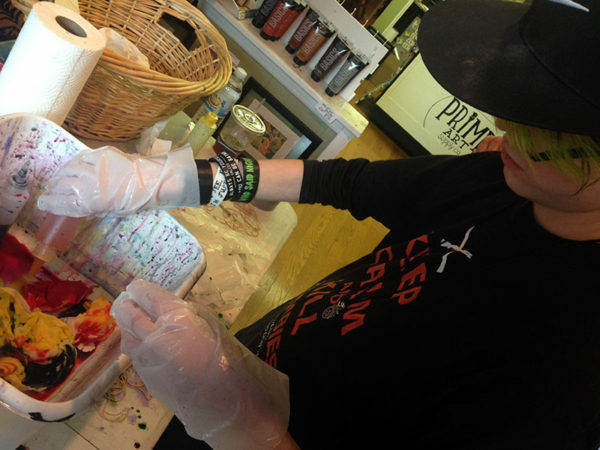 During First Friday in downtown York in July, Sarah both made a cool tie-dyed bandana at our friend Rita’s store, Prime Art Supply, and also got the autograph of Mike Hawthorne, the artist who draws Deadpool in comics, who happens to be from York! 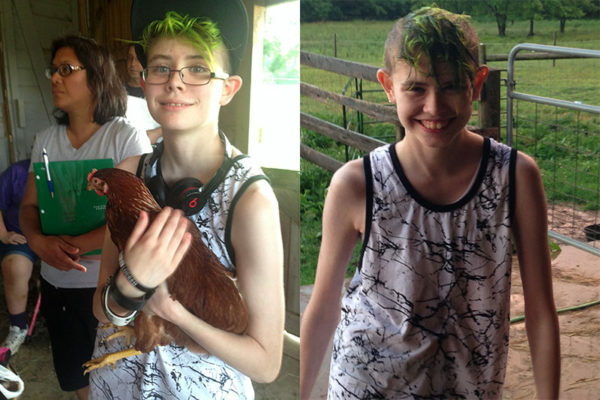 At our June alpaca club meeting, Sarah got cuddly with a chicken and got to play in a huge rainstorm that came up. Color Your Own Civil War: This means the Marvel version, not the America-vs.-itself version. We love coloring nights and this was a new find of Sarah’s. DK Smithsonian Wildlife of the World: Sarah got this for Christmas and loves reading her favorite parts of it. Q-Space: Sarah’s been working on this Star Trek novel for quite a while. Double-Cross: The True Story of the D-Day Spies: This is a book that Dan recently bought about a World War II spy plot, and Sarah happened to see it sitting on the counter, picked it up and dug in. Now she’s borrowing it indefinitely. 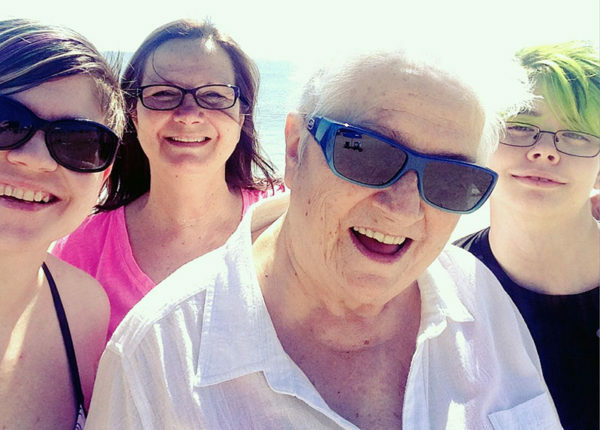 In early June, my mom, my oldest sister Linda, Sarah and I went to Rehoboth Beach for a few days and had an amazing time. A special note for our newer readers: I’d love for you to check out our post on learning from movies and TV shows. It really explains a lot about why we are such fans! Spy Hard: Sarah and Chris’ review was that this was pretty awful, but with a few funny moments. 1941: Sarah thought it was very funny. Chris greatly enjoyed the music and trying to dissect the ways in which the movie went wrong. The Whole Nine Yards: Because a movie with BOTH Bruce Willis and Matthew Perry is the ultimate treat for Sarah, and it was funny, to boot. True Lies: Again. Always. Arnold. Deadpool: My only requirement here was that Sarah had to find an agreeable adult to watch this with, since nobody in our house had any interest in it and since it really does require an adult. 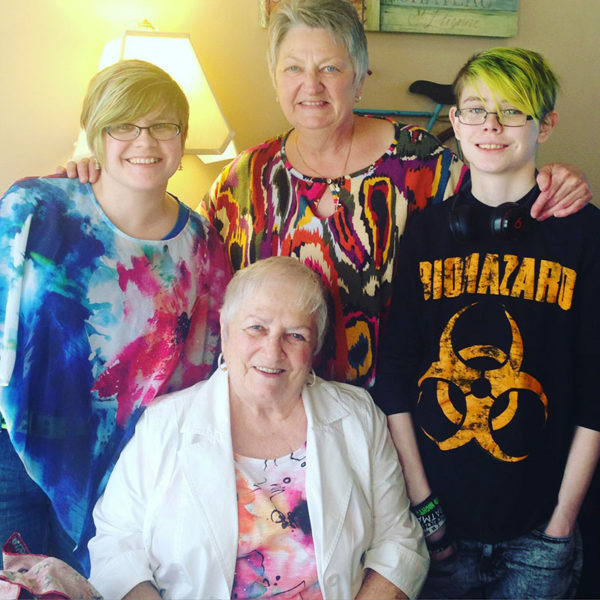 Her grandparents, who had already seen it, were glad to, bless them. The Truman Show: Sarah and Chris liked comparing this to The Matrix, one of Sarah’s favorite movies. Captain America: Civil War: Sarah, Chris, Dan and I went to see this once, then Chris took Sarah back to see it in D-Box. Walking Tall: The Rock as Defender of Small-Town America. How can you not love it? Deal or No Deal and Family Feud: Game shows, always. 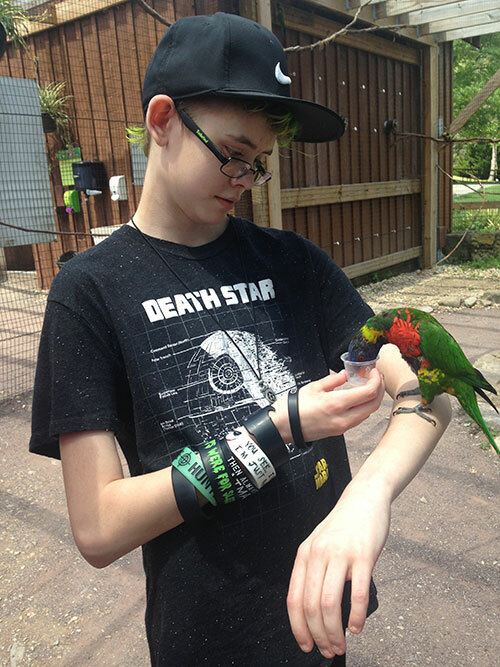 In July, we went to International Snake Day at the Lehigh Valley Zoo, and while there, Sarah and Dan fed these awesome rainbow lorikeets. The Gold Rush: More from Sarah and Chris’ silent-film streak. The A-Team: Mom and Sarah finished this TV series up in July. Scrubs: One of Sarah’s recent favorite series. Looney Tunes cartoons: Chris wanted to show these to Sarah, and she liked them. Central Intelligence: Also The Rock. Chris took Sarah out to see this. Edgar Allen Poe Tales of Terror: A Vincent Price favorite. It Could Happen to You: Somehow, Chris got Sarah to agree to a streak of rom-coms. I have no idea how, but she liked it. Only You: Also a rom-com. Three Pee-Wee Herman movies and his TV show: Not a rom-com. The Walking Dead: Chris and Sarah are watching this in the evenings and are midway through Season 4. I leave the room but always seem to walk back in when someone’s getting a machete in the head. Ew. But Sarah does love zombies. Saving Private Ryan: I feel like this list needed some higher-quality films, and this one certainly is. Big Trouble in Little China: Oops. There went that. Ender’s Game: We’d originally watched this at the movies, but wanted to see it again, which we did just the other night. Ghostbusters: This. Was. Hilarious. Our whole crew – me, Sarah, my mom, Chris and Dan – went to see this at our local movie theater and laughed like crazy. X-Men: Apocalypse: Chris took Sarah and her friend Danny to see this at the movies. Battlestar Galactica: Sarah and Mom are watching this now that they’ve finished The A-Team. 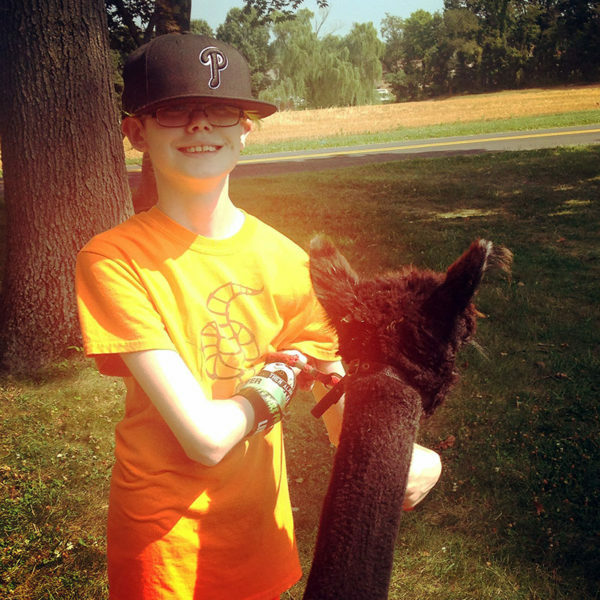 Coal, who was Sarah’s project alpaca for almost three years, left in July to go stay at a farm in Maryland for a year. This was taken on the day we went to see him off. 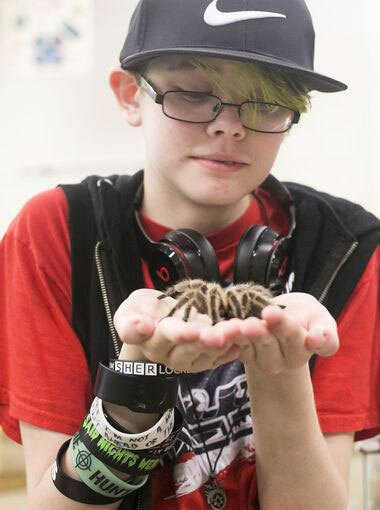 What, you don’t get cuddly with a tarantula? Sarah does. This photo was taken by a local newspaper, The York Dispatch, and even graced its cover! This is another area with prerequisite reading! I have a whole series about video-game learning that I’d also love for you to check out if you haven’t already. Lanterns: A cool table game Sarah bought for the family. MLB 15: The Show: Sarah’s custom player, Wolverine Logan (yes, really), retired after many years. This was a huge deal. Now his son, Wolverine Logan Jr., is her favorite. Guitar Hero Live: This is something Sarah and I like to play together. The Sims 3: Chris got this for Sarah and she has absolutely adored it. She recreated the Wolverine Logan family of MLB fame and that’s who her Sims family is based on. Destiny: Sarah got into this a couple years ago but found it really hard to play; lately, she has friends playing with her online and is really enjoying it again. 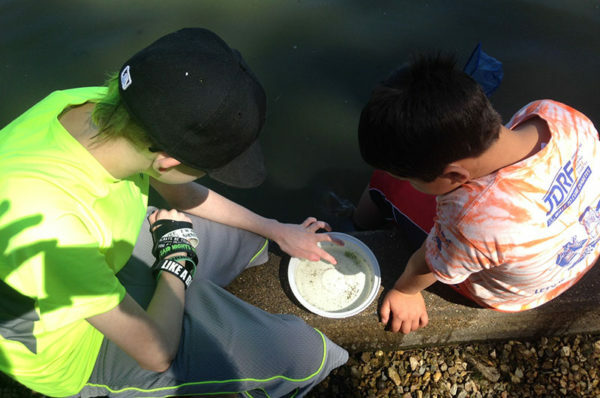 Sarah’s Wildlife Watchers 4-H club went to a local state park for a day of lake stomping and pontoon-boat riding. Here they’re investigating some of the water creatures. 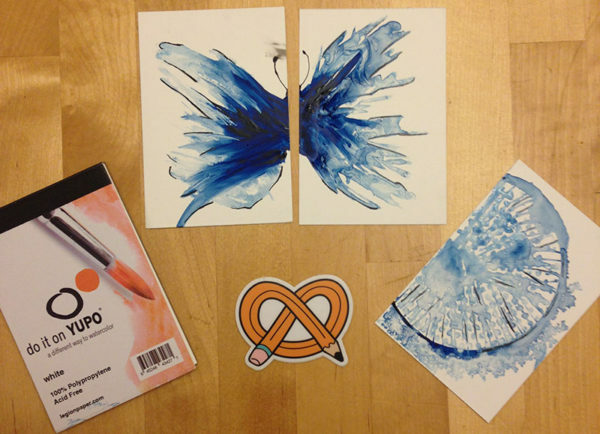 One of the cool things we’ve been doing lately involves Artsnacks, a monthly subscription service where you get cool art supplies (in a box, obvs) that you’re challenged to use to create something new. This was what I made with July’s, which included tiny Yupo paper that I loved. See, this is the part of the roundup that’s a problem when I don’t write regularly. It’s not that I don’t remember what we did – I actually keep a notebook/journal where I make notes about lots of cool stuff. It’s that it’s WAY TOO LONG! So I’m just going to try to hit a few highlights. Population density, language and medieval rock music: We started talking about the band Of Monsters & Men, the members of whom are from Iceland, and somehow that led me to mention Stary Olsa, which is a medieval Belarussian band that does rock covers, which I backed on Kickstarter. I don’t know how I found them either, so don’t ask. But somehow, talking about all of that led us to talk about population density and language in the Scandinavian and Eastern European countries. The North Museum: We’re members at this science museum in nearby Lancaster, PA, and we did a bunch of cool stuff there in the past couple of months. We went on a behind-the-scenes tour where we saw the collections not on exhibit, saw the preview of some new planetarium shows, and then went back to see those shows live. Relatedly, now we can identify Jupiter in the night sky. So we’ve been growing this gigantic pipevine for years as a potential butterfly habitat, but had not been able to attract any pipevine swallowtails. 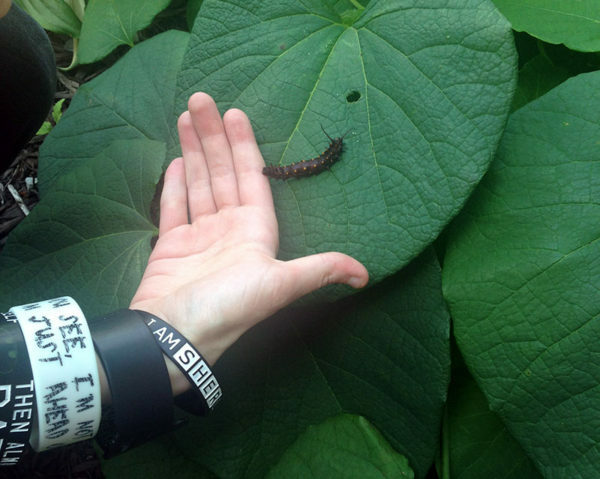 At the 4-H Insect Fair, one of the Master Gardeners for our area gave us a few caterpillars to release to try to get them started! Military dogs: We spent one evening reading all about dogs who’ve received the Purple Heart, dogs’ military ranks (did you know that every military dog outranks its handler?) and a bunch of people who’ve received the Congressional Medal of Honor. That was good for a bunch of crying from me, but a lot of cool conversations too. Dog intelligence: Sarah’s part of a dog project in 4-H, where she’s training my best friend Nina’s husky, Thor, since our dog, Coby, is 14 and not in great shape for excursions to the 4-H center and jumping over hurdles. But with Coby, we’ve been studying dog cognition, through a Coursera course, website and podcast by Dr. Brian Hare, a professor of evolutionary anthropology at Duke University who’s very cool. For Mother’s Day, Sarah, my mom, Mom’s good friend Sandy and I went out for tea. Hamilton: Just like basically the rest of the country, we love this musical. And, of course, cannot afford tickets, no matter how much I’d LOVE to take Sarah to see it on Broadway. So we listen to the soundtrack pretty much constantly and have had some truly cool conversations thanks to it. Working out: We joined a gym. I don’t really know what to say about this, as I am decidedly an outside toy, not an inside toy, but it’s something Dan, Sarah and I can do together and it’s not too expensive. 4-H: So, so, so much to say here. Our Wildlife Watchers club had a picnic and went to Gifford Pinchot State Park for a lake stomp and pontoon tour; the alpaca club is swimming in new crias (baby alpacas) and gearing up for the fall shows, while still finding time for an annual pool party where Sarah never left the water; and most fun of all, Sarah was one of the 20-some representatives of York County at the recent 4-H State Achievement Days held in State College, PA, where she participated in a “Microbe Mania” program learning about the microbes that affect plant life. Oh, and we went to our county’s Insect Fair, where Sarah held a scorpion and a tarantula. Snakes! Why did it have to be snakes? We went to International Snake Day at the Lehigh Valley Zoo (where we’re also members, in addition to the North Museum). We got to see rattlesnakes up close (it’s the first time I ever heard one rattle) and got to pet some non-venomous snakes. Sarah absolutely loves petting snakes and spiders. Me, not so much. 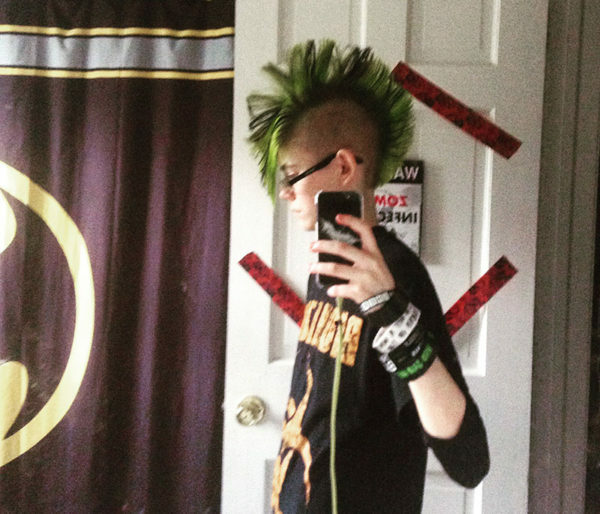 Rockstar mode Sarah, complete with mohawk and biohazard T-shirt. Chernobyl: I’m not sure how we got on this topic, but we spent one evening watching videos of Chernobyl, including this one about The Russian Woodpecker, a huge satellite wall, and this one about radioactive bananas. Oh, and also how to visit Chernobyl. That whole video series is amazing. This entry is about homeschooling, monthly wrapup, parenting, science, technology, trips, unschooling, video games. The previous post was Happy birthday to the original James Bond, Sean Connery. The next post is The unschooled version of an 11th-grade-ish curriculum plan for 2016-17.